We are, in general, starting to see more cross-platform free music software, but we're exclusively in Windows territory this week. Mac owners, then, can look away now (or look on in envy); PC users should get their download fingers ready. Designed for creating rhythmic pads and basses, this 3-oscillator synth sports two filters, amp and filter envelopes, delay, EQ and a flanger. There's also a 32-step sequencer and, if you're feeling lucky, you can randomise all parameters with a single button press. Two freebies in one bundle. HUE-X is an EQ that's designed for people who like to experiment with sound, giving you ten descriptively named faders to tweak. M4GIQ, meanwhile, is a multi-effect that enables you to apply gain, panning and delay to each frequency band, so you can spread frequencies across the stereo image. This ad-supported instrument is based on additive synthesis technology and comes with four waveform types and 32 harmonics that can be drawn with your mouse. You can also adjust the attack, decay, sustain and release for each harmonic, while a low-pass/high-pass filter, an LFO and chorus can be called into play, too. 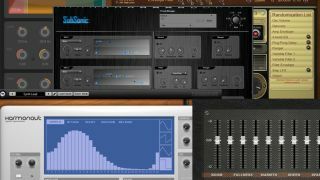 Billed as "the synth that takes you back," SubSonic is a subtractive instrument that promises to give you a vintage sound. Among its tools are three oscillators, a graphical ADSR envelope, a multimode filter and reverb, delay, chorus, flanger and warper modules.